year 2, week 37: this week i'm gonna... connect children with therapy dogs. Pam Gaber and her dog, Gabriel, met thousands of children over the 10 years that Gabriel served as a therapy dog. But Pam will always remember the little boy in the Spiderman T-shirt that started their journey. This little boy had just been admitted to Crisis Nursery, a Phoenix shelter that takes in young children facing abuse and neglect. Pam, a volunteer at Crisis Nursery, brought Gabriel to the shelter's Christmas party dressed up as Rudolph. When the sobbing child nuzzled the silver Weimaraner, he started to smile and then laugh. "I was watching an animal reach a child in a way no adult could," recalls Pam. At the end of the evening, Pam got back in her car and looked over at Gabriel. "What did you just do?" she asked him. She realized she and Gabriel were on to something -- Gabriel was bringing out compassion in children, many of whom had rarely received compassion themselves. Thus, Gabriel's Angels was born. Gabriel was registered as a therapy dog and became a regular at Crisis Nursery. Pam recruited two friends with dogs to register them as therapy dogs as well, and once word spread to other agencies of their success with the kids, "it all snowballed," says Pam. Gabriel was perhaps the most enthusiastic of all - he would spin in circles with excitement whenever Pam pulled out his dog therapy vest. Sadly, Gabriel passed away in 2010. During his ten years as a therapy dog, he reached over 10,000 children and left an inspirational legacy of unconditional love and promise for thousands of abused, neglected and at-risk children. His legacy lives on through the organization that now bears his name. Gabriel’s Angels serves 14,600 abused, neglected, and at-risk children in Arizona through the application of innovative pet therapy. The program’s goal is to increase the overall sense of well-being and happiness for children and to build critical core behaviors, such as trust, empathy, respect, tolerance, and self-esteem. 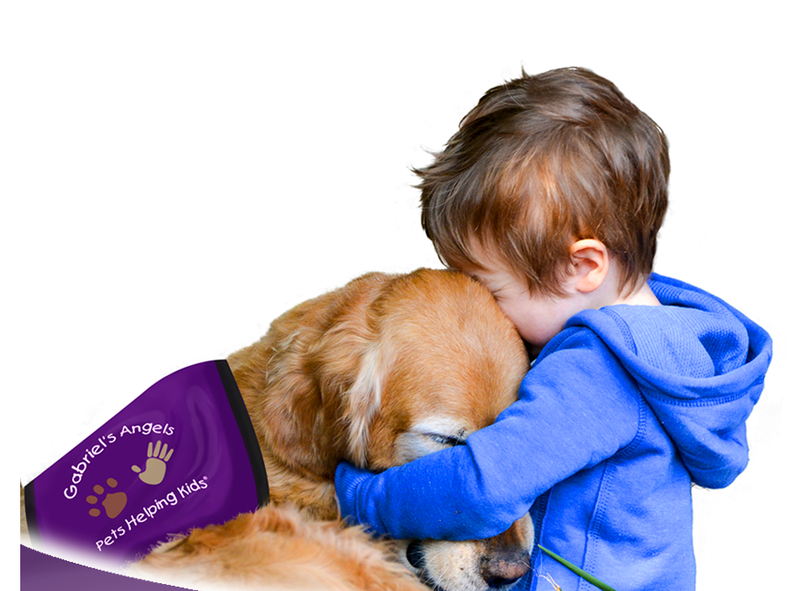 Gabriel’s Angels believes that the bond between a therapy dog and a child is strong enough to break the cycle of violence. Gabriel’s Angels currently has approximately 185 registered volunteer Therapy Teams and 40 Helping Hands delivering pet therapy to over 122 agencies. All services are free of charge. The therapy-assisted activities are provided by the Pet Therapy Team, usually consisting of a companion dog and his/her owner. The future vision of the organization is to expand the therapy program to meet the needs of approximately 7,000-10,000 additional Arizona children that could benefit from therapy dog services. Gabriel's Angels strives to let children meet with animals on more than one visit, to build their sense of trust. "They get to gently brush the dog, listen to the heartbeat, and come to understand they're a living creature, just like me. If children can learn empathy and compassion, that is the key to be able to transfer it to others," Pam explains. Vickie Healey is a Gabriel's Angels volunteer who has experienced firsthand what many of the children are going through. Healey herself was in foster care until she was 4 years old and then was adopted into an abusive home. When Vickie decided to go through therapy-dog training with her dog Coco, she braced herself. “We knew with a pit bull, there might be weird looks,” says Healey, a longtime Tucson resident. Story sourced from azcentral.com, tuscon.com, and Family Circle magazine. September is National Service Dog Month! Our collective givetwig donation will sponsor approximately 2-3 months of training and support for one Therapy Team. You can read more about Gabriel in Pam's book, Gabriel’s Angels: The Story Of The Dog Who Inspired A Revolution. For more information on Gabriel's Angels, please check out their website. this week i'm gonna donate to Gabriel's Angels.